Absolutely taking the world by storm in just the last few years, Dropbox has become the “go to solution” when it comes to backing up your files and having instant access to them across any number of devices at the exact same time. Maybe one of the most easy to use software solutions anyone has ever seen, Dropbox continues to innovate and push the boundaries of “cloud-based storage and sharing” on a daily basis. Best of all, we get to use the Dropbox service completely and totally free of charge. Here is a quick review about what many consider to be the very best of the best when it comes to file hosting, sharing, and backup – Dropbox. File hosting and sharing has never been as easy as it is with Dropbox. Literally all you have to do is sign up for a 100% free account on the Dropbox website, download their desktop software (or the mobile application for your specific operating system), and begin dumping files into the folder that they create for you. That’s literally it – it’s as close to “set it and forget it” as you’re going to find in the file hosting world. Thanks to the full integration of SSL encryption (using government grade 256 bit AES encryption technologies), each and every piece of information you decide to host in Dropbox – or share of across all of your devices – will be protected to the highest possible level. This gives you the peace of mind, safety, and security you need when using Dropbox, guaranteeing that everything you post to the “cloud” stays under your control every single step of the way. While there are any number of different file hosting services out there, none of them – NONE of them – are able to offer you the same results across this many devices. Dropbox works with almost any device under the sun, including desktop PCs, Mac computers, laptops, tablets, cell phones, iPhones, Android devices, and almost anything else with an Internet connection and a storage service. This guarantees that you’re going to be able to link into your Dropbox account regardless of where you are or what device you are using, enjoying all the benefits of this service has to offer without interruption. 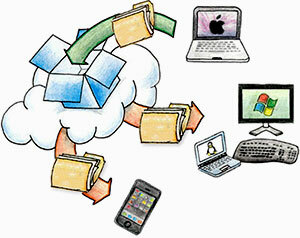 The best of the best, there is no more complete service for filesharing, backup, or cloud storage and than Dropbox.